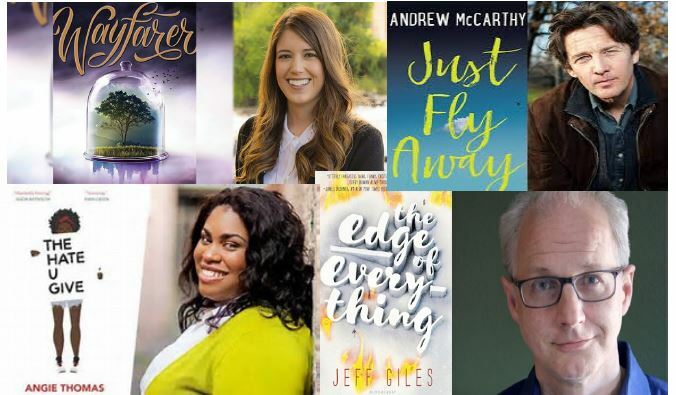 I’m excited to be moderating the Hollywood Calling panel at this weekend’s TeenBookCon. At the panel you can ask the four featured authors questions, and learn more about their books and writing life. If you stay until the end of the day you’ll have the opportunity to meet them and have books signed. Alexandra Bracken has written several books for young adults including The Darkest Minds series and The Passenger series. On her author page she describes her writing, “I write about teens with superpowers, time travelers, family curses, and damsels in distress who save themselves.” She has also written a middle grade title called The Dreadful Tale of Prosper Redding and a novel about Star Wars called A New Hope: The Princess, the Scoundrel and the Farmboy. An experienced journalist, Jeff Giles has written his first young adult novel, The Edge of Everything. When I hear the name Andrew McCarthy I will forever think of Blane in Pretty in Pink. Others may know him from his roles on the television shows: Law & Order, Lipstick Jungle, White C ollar or The Family. Besides being a prolific actor, McCarthy has also written numerous articles (predominately about travel), and published a best selling travel book called The Longest Way Home. His new project is a young adult novel called Just Fly Away. Angie Thomas’ first novel, The Hate U Give burst onto the NYTBS the same week that it was released. Since that time it has been highly praised, and is a hot topic on social media and in library and bookseller circles. Previous Houston: D3N! @L Pop-Up Show Tonight Only!